Cast Iron Skillet Pizza is the best way to make pizza at home. 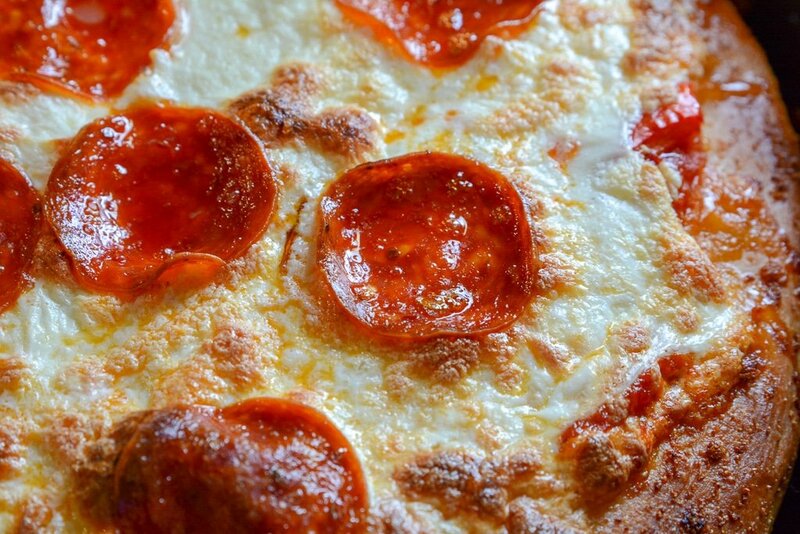 You have a crispy dough that is thick, topped with pizza sauce, and piled high with toppings. Our go-to is mushrooms, peppers, and of course a good handful of mozzarella cheese. 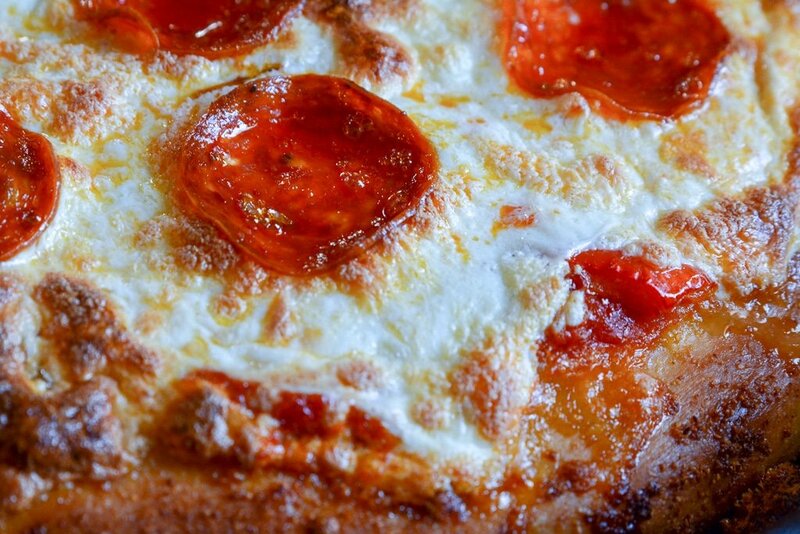 If you want to learn how to make cast iron skillet pizza, this recipe is for you. One thing I love about living in central New York is Italian food. We have a pizza place on every corner with the best pizza. I have made pizza from home several times but there is nothing like pizza made in a cast iron pan. The crust is crispy and the dough is thick and delicious. I could not wait to try out the Cast Iron Skillet Pizza. When time allows I always make homemade pizza dough. I find it adds more flavor and depth into the pizza. But, if I am short on time, or just can’t muster up the effort I have no shame in reaching for store-bought pizza dough. 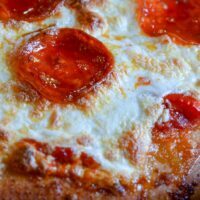 When you make cast iron skillet pizza it really transforms the flavor of the pizza dough! One little trick I found is letting that cold pizza dough rest in your cast iron skillet as the oven is preheating all the way up to 500 degrees. I just spread my pizza dough on a greased skillet, and then wrap with saran wrap. This will help prep the dough for baking in the oven. It allows the crust to cook more even when the chill wears off of the dough, and you get that golden and crunchy crust like you would at your favorite pizza place. Looking for ways to top that pizza of yours. Here is a handful of ingredients you can mix and match to make a pizza that will win over your crowd! Meat | Sausage, ground beef, pepperoni, Canadian bacon, etc. Play with cheese like feta, provolone, etc. You can opt for any of your favorite pizza toppings. If you enjoy it, then toss it on. If you are not a fan of eating pizza cold, try this route! Turn oven to 275 degrees, and place your pizza slices on a baking sheet. Wrap in aluminum foil, and bake for 15-25 minutes or until the pizza is warmed through. 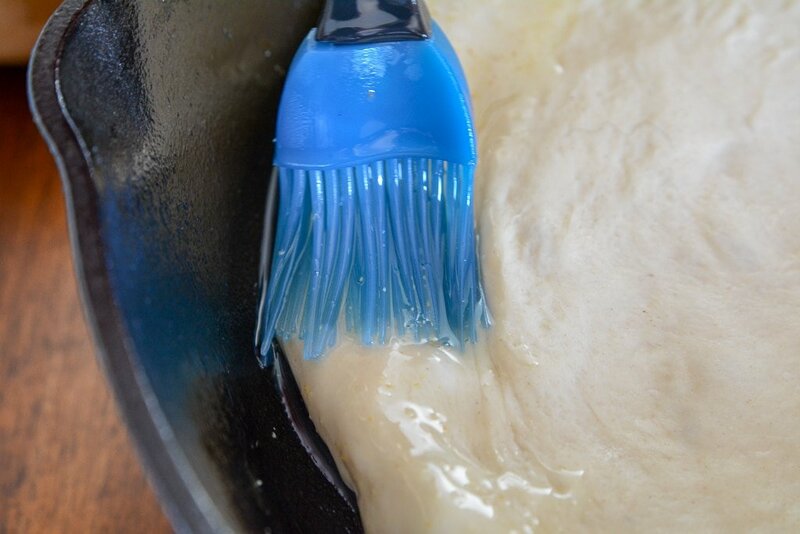 This will help to give you that first-day texture of a crispy and warmed crust. Or you can microwave or warm your pizza on a skillet on the stove. Either route works, I just find the oven method gives you the freshest taste. 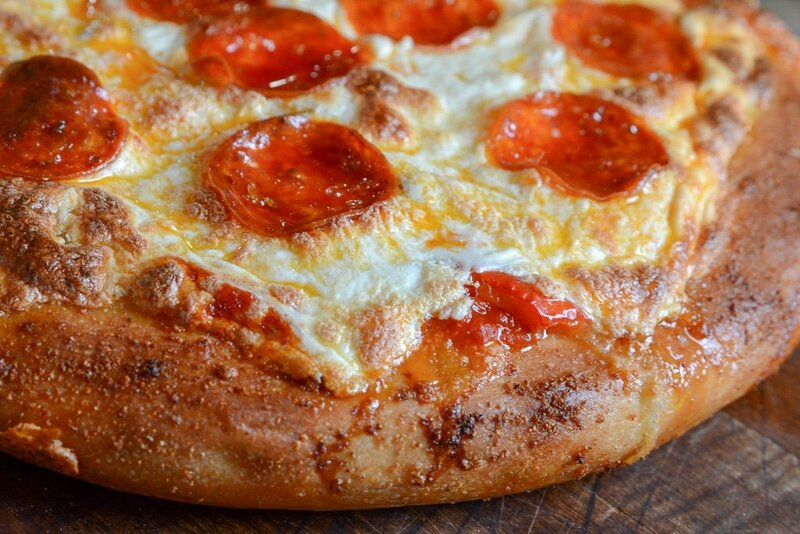 If you are a lover of pizza, this cast iron skillet pizza will be calling your name for sure. We love pizza in our home, and this is my go-to method for making homemade pizza. Turns out awesome every single time. Looking for a great Wing Recipe to go with your pizza? Ninja Foodi Crispy Wings are done in minutes. Cast Iron Skillet Pizza is the best way to make pizza at home. You have a crispy dough that is thick, topped with pizza sauce, and piled high with toppings. 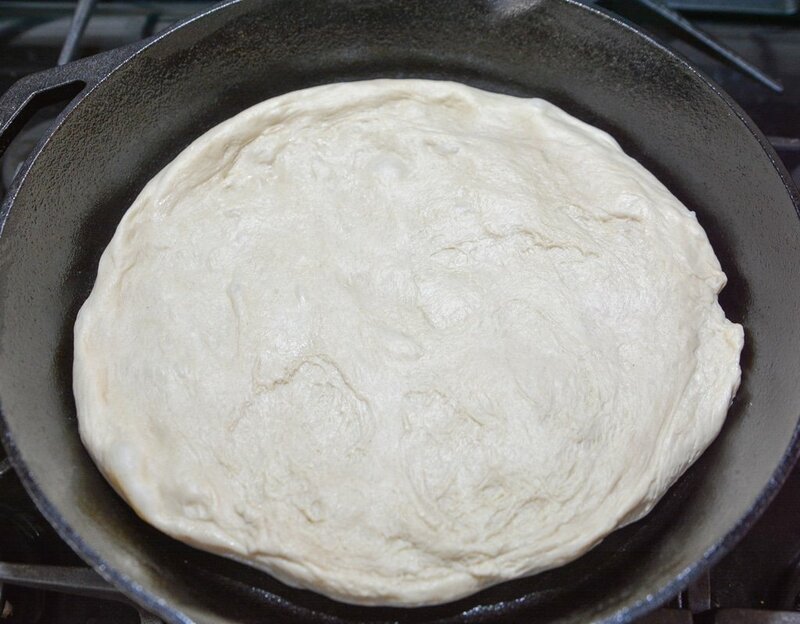 Oil your cast iron skillet and place dough inside cover with saran wrap and let sit while the oven is preheating about 20 minutes. ﻿Place your skillet in the oven for 15 minutes or until cheese is bubbly and brown. 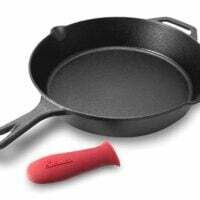 If you like an extra crispy crust you can place the skillet on top of the stove for 1-2 minutes.